(Organic Slant) A growing body of scientific evidence continues to confirm the widespread health effects of Weed and Feed products. 2,4-D, the pesticide in most Weed and Feed products, is a neurotoxicant. Studies show that exposure to 2,4-D is associated with neurological disorders, reproductive problems, kidney/liver damage, non-Hodgkin’s lymphoma and other cancers, and disruption of the endocrine (hormonal) system. Each year Americans apply an estimated 27 million pounds of weed ‘n feed to parks, cemeteries, home lawns and anywhere else mown grass is found. A mix of three “phenoxy herbicides” called 2,4-D, dicamba and mecoprop typically blended together into weed killers and weed ‘n feed products, they kill broadleaf plants such as dandelions while sparing grass. The lure of convenience, and effective marketing, have made weed ‘n feed among the most frequently used lawn care products. Short-term effectiveness is gained at the expense of long-term lawn and soil health. The overpowered chemical fertilizers these products contain actually weaken turf—causing the kind of fast, weak, unnatural growth that’s susceptible to pests and disease. Giving up the weed ‘n feed does not mean you’ll have to live with a weed strewn lawn. Organic lawn care practices, combined with nontoxic pre-emergent herbicides, will restore your weed patch to a healthy lawn, over time. The weedkillers (phenoxy herbicides) used in weed ‘n feed products are persistent, bioaccumulative toxic substances linked to cancers and to reproductive, immunological and neurological problems. Some of the herbicides in chemical weed ‘n feeds—especially 2, 4-D—have been linked to increased rates of cancer in people and dogs. Granular weed ‘n feed products cling to shoes and children’s clothing if they have playing on the lawn, and are easily carried indoors where they persist in the home environment. Dust is carried by the wind to neighbor’s yards, where the particles can also tracked indoors. Studies show that children and pets who play on toxically treated lawns absorb pesticide residues into their bodies. In recent governmental studies, researchers found that all study participants had residual toxins in their blood, including pesticides. Children in similar studies show pesticide residue markers in their urine. Studies have shown that lawn chemicals drift and are tracked indoors where they may remain in carpets and on surfaces for up to a year when not exposed to direct sunlight. A single turf application of 2,4-D can remain inside the home at exposure levels ten times higher than pre-application exposures. In a 2003 study of indoor air toxins, 2,4-D was detected in the dust of 63% of sampled houses. 2,4-D has been shown to have negative impacts on a number of animals. Studies have found that dogs whose owners use 2,4-D lawn products are twice as likely to develop canine malignant lymphoma. The latest EPA assessment of 2,4-D acknowledges the susceptibility of dogs to poisoning by 2,4-D and other lawn pesticides but does not propose any label warnings to users. Quick-release fertilizers, commonly used in most weed ‘n feed products, apply a quick and heavy dose of nutrients to the lawn, and are more likely to wash off when watered or after it rains. Even if you don’t live near the water, pesticides from your yard could travel through storm drains untreated to the nearest stream or lake, or seep into the water table. Nitrogen and other plant nutrients create algae blooms that smother aquatic life forms in streams, ponds, rivers and even the ocean. In addition, a main ingredient in “weed and feed,” 2,4-D or 2,4-Dichlorophenoxyacetic acid, has recently been cited as a contributor to contaminating salmon habitat. Once you begin a program of using synthetic fertilizers, your lawn becomes dependent on these chemicals to ensure a healthy weed-free look year after year. However, over-fertilizing with synthetic chemicals disinfects or kills most of the beneficial fungi and organisms in soil. This makes it more difficult to build naturally healthy turf which contains beneficial organisms. The good news is that you can have a beautiful, healthy lawn without using blanket applications of synthetic lawn care chemicals. 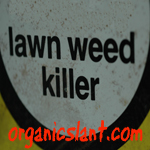 Building a healthy, organic lawn is the best way to choke out weeds. Lawns that are maintained properly through regular care (i.e. feeding, aeration, watering, and mowing), should only need ‘spot treating’ of limited problem areas. Consumers should also realize that weed ‘n feed products may kill existing weeds, but do not prevent new weeds from growing. You can prevent new weeds from germinating by applying a pre-emergent herbicide during that first warm spell in spring and in the early fall. One of the best pre-emergents is corn gluten meal, a completely natural substance that also provides the benefits of fertilizing. Corn gluten meal is an organic alternative to weed ‘n feed. Another effective method of controlling dandelions is pulling them manually. This may seem to be too difficult, but newly designed dandelion forks, which have a curved plate welded to the shaft, are very easy to use for pulling even the most stubborn dandelions. If your lawn is modest in size, a small investment in a dandelion fork will yield good results. For the health of our families, neighbors and our environment, pesticide use should be a measure of last resort.